When I bought my cabin in the mountains some 10 years ago, it was with some vague idea of re-creating the place that I loved most in my childhood. My family had a cabin on a lake in northern Wisconsin, where we spent two weeks each summer. Far from the suburbs of Chicago, I got my first taste of wilderness—chipmunks, loons, bears, and more stars at night than I ever imagined. It was my first glimpse into the universe, of something larger and more profound than my mundane daily existence, something that hinted of another world beyond what I had known. It wasn’t until I was 58, when much of my work life was behind me, that I bought the small cabin in Colorado and could start exploring those feelings first stimulated by the Wisconsin woods. Growing up the eldest of seven children and then working in high-energy, deadline-driven jobs for most of my career, I had to ignore my need and desire to get deeper into life. 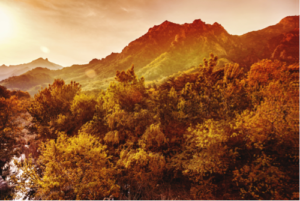 But at the cabin, in the shadow of a 14,000-foot mountain and among the swaying ponderosa pines, I found a safe place to turn inward, to align my breath with the winds that rushed down from the mountain tops. Sometimes it takes two days, but by letting myself settle into the cabin—with its thin, knotty-pine walls and hand-made rock fireplace that feel like an extension of the natural world—my mind slips down a cog and settles enough to start observing the world around as well as inside me. My thoughts drift as slowly as the softly twirling seed heads in spring or the gently falling snowflakes in winter that descend from the sky. With little or no access to the larger, outside world—I have no TV, no cell phone access, and only occasional Internet service—I can shut out a world of constant interruption and over-stimulation, full of anger and trivialities, and one that runs faster than I can keep up with. At my mountain cabin, I have something few people in the modern world get to experience: utter peace and silence, where the loudest sound can be the wind rustling through the aspen leaves. Here, there’s enough silence to hear my thoughts—sometimes cantankerous, sometimes profound, often sad. In the past few years, as I’ve watched my parents endure the hardships of aging and faced my own losses, I wanted to know for myself: how do you enjoy life when you know how it will end? 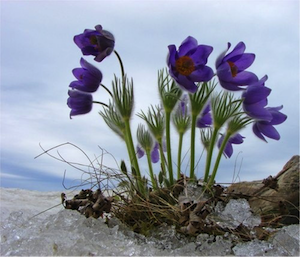 First, I learned from the pasqueflowers, which emerge just as the snow melts and miraculously can spring back to life after a late-spring snowstorm buries them under two feet of snow. Weather conditions in April can be spitting snow, freezing nights and destructive winds yet, as soon as the sun returns, the pasqueflowers open their deep purple cups and let themselves be filled with light. Life manifests when conditions are right, according to Buddhist philosophy. And for one day, or one week—sometimes two—the conditions are perfect for the pasqueflower to manifest its light. Too soon, after only a few weeks, the flowers have disappeared, leaving behind seed heads that blow like long tresses in the wind. And leaving behind the other question we ask of life: why is this existence so short? I came to realize that the pasqueflowers don’t die but retreat underground, as do all the other plants here—the columbine, the bluebells, the purple lupine and golden banner, and the willow bushes and aspen trees. Deep in the dark earth, they endure and regenerate. Just like the bears, chipmunks, and ground squirrels that hibernate for the winter and emerge with a new generation. Or like the creeks buried under several feet of snow all winter, and the fish that huddle at the bottom, barely breathing. If I listen carefully, on a windless day in winter, I can hear the muffled creek pulse out its life beat. There’s another lesson I study in nature. From the small animals around the cabin, I learn how to live without fear. Although the squirrels and rabbits are on the bottom of the food chain—prey for any wandering coyote, bobcat or weasel—they give every appearance of enjoying the moment they have: chasing each other around the woodpile, lazily stretched out in the sun, thoughtfully chewing the fresh blades of grass. Following their example, I lean back and watch the barn swallows dart high above the valley, backlit by white clouds that sail across the sky. I search the willow bushes for the dazzling colors of the hummingbirds, those fragile-looking birds that migrate thousands of miles and often arrive here at the same time as May snowstorms. In nature, I see a strong desire for survival, to endure and thrive. In the slightest crack in a boulder, a pine tree finds a foothold, its roots inching out in every direction, looking for sustenance. I have read that the best conditions for a ponderosa tree to grow happen only once every sixty years, and yet each seed has some imperative to live. In all of us, there is some will to survive, even against great odds. We keep going until we can’t any longer, like these tall ponderosa pines that have endured decades of drought, freezing temperatures and invading insects. Yet in a few minutes, they can be felled by winter’s strong winds. I mourn each loss at the same time I admire their tenacity, how their tangled roots still cling to the rocks even as the massive tree and its branches lie flat on the ground. I’ve dug my own roots into this mountain retreat. As long as I can hold on, I’ll listen to nature’s enduring message: life is precious. 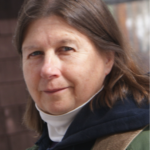 Kathy Kaiser is a writer and editor living in Boulder, Colorado. She worked as a journalist for several Colorado publications and later as a freelance book editor. Most recently, she was editor of Senior Spirit, a nationwide newsletter focused on aging issues. She contributed an essay to Until They Have Faces: Boulder Stories of Resilience, Recovery and Redemption (2012) about the homeless, and her short story, Barbara and the Bear, was awarded first prize for fiction in the ACC Writer’s Studio contest (April 2013). She writes a blog, Cabin Journal, about her cabin in the Colorado mountains. She’s an avid hiker, meditator, reader and naturalist. Ah, Kathy, this is a lovely meditation on how nature heals our souls. Thank you for sharing your experiences. This is a beautiful piece, Kathy. Particularly in these painful and frightening times, it’s helpful to be reminded of what still endures, for however long we still have it to cherish. Thanks for all the fine writing you do to help keep us calm and clear in the midst of the maelstrom. Thanks, Jennifer. In these times, nature gets more precious. Thanks for this lovely piece. It’s heartening, uplifting, and peaceful. I’m planning to share it with friends. Thanks, Linda, and thanks for sharing it. Thanks for taking us with you into a state of peace few of us have access to, or take the time to experience anymore. Your writing perfectly evokes the solace of nature. Beautiful, Kathy. The way you write I am taken into your world at the cabin. So much wisdom the whole experience has to teach. I can see why it is such a refuge and an inspiration to you. Thanks, Sally. The cabin world is a very special place. Hi Kathy, where was your cabin in Wisconsin? We have had a cabin there since 1930. My great grandparents built it with their family…in Manitowish Waters….30 miles north of Minocqua. I still get up there for about a month each year.